BEFORE: It’s a new day and a new month. The beginning of August sees the start of my four-day Western chain with A Fistful of Dollars. All four films in this chain are directed by Sergio Leone with the first three being part of his “The Man With No Name Trilogy” staring Clint Eastwood (last seen in Dirty Harry). 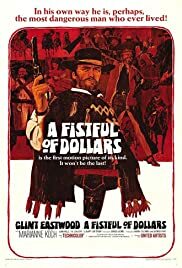 AFTER: A Fistful of Dollars was very neutral; there wasn’t anything particularly exciting about the film but there wasn’t anything horrible to detract from the enjoyment either. It was nice to see Eastwood try and MacGyver his way out of some tight situations throughout the film and the score, done by Ennio Morricone, was great to listen to. But the characters could have been defined better, it was difficult to know who was part of which two families vying to rule the town: the Rojo’s and the Baxter’s. Not the best Western there is, but not the worst either.